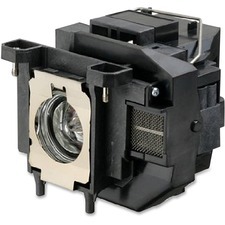 Ultra high-efficiency projector lamp is designed to replace the original genuine Epson projector lamp included with the projectors. Lamp is compatible with Epson MegaPlex MG-50, MG-850HD Easy Home Theater 3LCD Projector; PowerLite Home Cinema 500, 707 720p, 710HD 720p, 750HD 720p; EX3310, EX3212 3LCD Projectors; EX5210 XGA 3LCD Projector; EX6210, EX7210 WXGA 3LCD Projectors; PowerLite 1221 XGA, 1261W WXGA, S11 SVGA, W16 3D, X12 XGA, X15 XGA 3LCD Projectors; VS210 SVGA, VS220 SVGA, VS310 XGA, VS315W WXGA, VS320 XGA 3LCD Projectors; and PowerLite W16SK 3D 3LCD Dual Projection System. 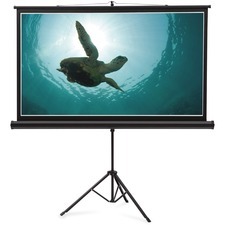 High-contrast 80" portable cinema projection screen delivers precise images for a guaranteed clear picture. Lightweight, 22 lb. screen is ideal for the home or office. Expands from 50" to 74" high. Modern Euro™ design provides sleek styling and maximum durability. 100% Satisfaction Guaranteed. 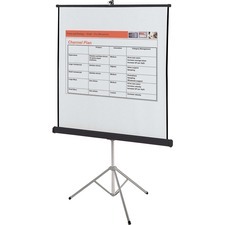 High-resolution 70" x 70" portable tripod projection screen enhances the look of any presentation. Innovative keystone corrections system promises the clearest, least distorted image. Matte white surface provides a precise image. Retracts into steel carrying case. 100% Satisfaction Guaranteed. Enhance the appearance of media based business presentations with a wide format projection screen. Hi-res, projection screen features a 16:9 aspect ratio. Screen surface is matte white, durable vinyl. Tripod base ensures stability and is easy to set up/collapse. 45" x 80" screen size. 5 year warranty. Sturdy, versatile mechanical stand allows you to move your interactive board from location to location quickly and easily. 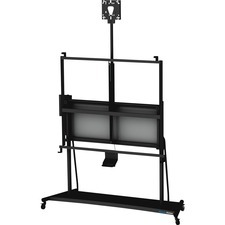 Easy projector mounting panel adjusts from 76" to 86" high for the most precise projection calibration. Evolution IWB Stand with pi-plate holds the interactive whiteboard firmly and solidly in place and allows you to adjust the board height. Heavy-duty steel construction with matte black finish includes four heavy-duty locking casters for stability. Stand is also designed for use with ultra short-throw projector. 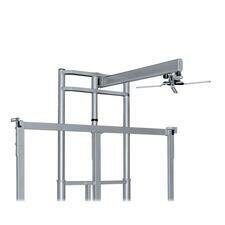 Short-throw projector arm is designed to work with Balt iTeach and Elevation Wall Mounts. Arm holds up to 25 lb. projectors. Throw distance is 22-1/2" to 48". Included adapter allows use with universal mounts. Projector arm is made of steel with plastic parts. 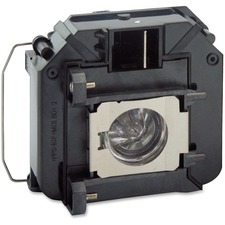 The genuine ultra-high efficiency (UHE) projector lamp is designed to replace the original genuine Epson projector lamp that lasts up 5,000 hours in normal mode and up to 6,000 hours in Eco mode. You can replace yourself according the instruction in the projector's manual. Use in your Epson PowerLite 92, 93, 93+, 95, 96W, 905, 420, 425W and BrightLink 425Wi and 430Wi projectors. 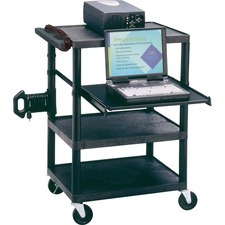 Quartet® Duracart™ Multimedia Projector Cart With Laptop Shelf, 3 Shelves, 3-Plug Outlet, Black - 3 x Shelf(ves) - 18" Height x 24" Width x 35" Depth - Floor - Steel, Plastic - Black Rugged, adjustable 3-shelf all-purpose multimedia projector cart with steel laptop shelf. 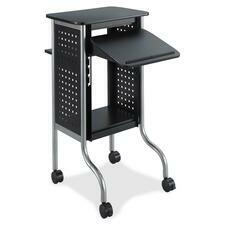 Constructed with a dent-, scratch- and stain-resistant graphite plastic for heavy use in classrooms and offices. UL-approved 3-outlet electrical strip with 15' cord. 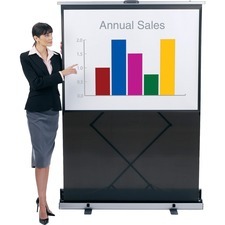 Scoot Presentation Cart provides three platforms for the perfect presentation combination. The stylish multi-platform cart has the ability to hold a laptop, LCD screen and projector to support both current and future technological advancements. Design also features a height-adjustable shelf at a convenient, 15-degree tilt that is adjustable in 2-3/4" increments in four positions - from 24-1/2" to 32-3/4". The bonus bottom shelf gives the added luxury of storage on the go. Presentation cart rolls smoothly on four 3" casters (two locking).